Whenever flooding strikes, whatever the cause, immediate expert flood services can keep flood damage and repair costs to a minimum. It doesn’t take a waist-deep basement flood for you to need professional emergency water damage services. Even a bathtub overflow can cause big problems if it isn’t immediately and thoroughly mopped up. And sewage cleanup is certainly something you don’t want to take on yourself! Whether a home or business, buildings on Staten Island face a triple threat: storms, old plumbing, and frozen pipes. It doesn’t take a Hurricane Sandy to cause serious flood damage. Through excellent flood cleaning services Joe Kielbasa’s stays busy year after year. Long before storm water has risen above a door threshold rainwater can be making its way in through a damaged roof, poorly sealed windows, or cracks in basement walls. Older buildings often mean older plumbing that can fail at anytime of the year, dousing the carpet and rooms below. A water heater or washer hose that’s just 10 years old can rupture, quickly releasing a surprising amount of water. Finally, with poor maintenance pipes can freeze, crack, and then burst as soon as they thaw. So what’s that one solution? Prevention. Keeping your building and plumbing in shape with regular inspections stops problems before they happen. And if there is a catastrophe, swift action can prevent further water damage. To prevent further destruction all water and even excess moisture must be removed as quickly as possible. When more than a small portion of a room is affected, do-it-yourself methods rarely succeed (www.iicrc.org). To be fast enough, water removal requires fast pumps and powerful water extraction extraction equipment. It’s usually necessary to lift or remove carpet as well as to remove baseboards, and even open up holes in walls to expose dampness. Then dehumidifiers and high-volume air movers are required to pull out moisture that’s soaked into building materials. Without a complete dry out harmful moisture can linger for as long as a month or even more. Given enough time wood rots and even concrete weakens. Both storms and plumbing problems can cause sewage to back up into floor drains adding a major health hazard to a basement flood. That calls for extreme sanitation measures to protect workers and extensive disinfection efforts. In addition to tainted water, mud, and debris, disease-causing pathogens become airborne. Even without sewage contamination, water from any source should be assumed to be filled with dangerous germs, viruses, and pathogens after 24 hours in contact with the ground or flooring. A toilet overflow also requires extra care. We’ve been providing flood cleaning services since 1986 — that’s 30 years and counting. 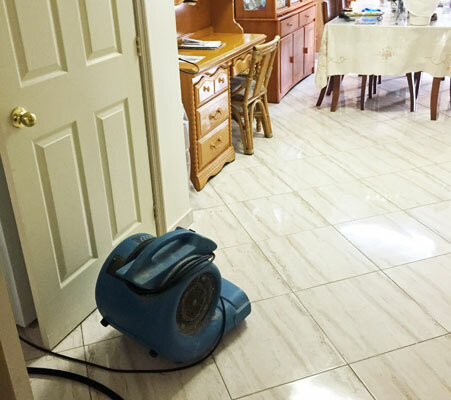 Locally owned and operated, our emergency water damage service crew is ready 24 hours a day 7 days a week and can arrive anywhere in Staten Island within an hour. Fully licensed and insured, we have the training, experience, and equipment to take care of flood damage and mold remediation promptly and properly. If you have flood coverage you’ll have little or even no out-of-pocket expenses. We’ll help with filing a claim, and will wait for you to receive your reimbursement before your payment to us is due.